Hydrangea Anomala Petiolaris (Climbing Hydrangea) has masses of creamy-white lacecap flowers from May to July and dark green leaves turning butter-yellow in autumn. 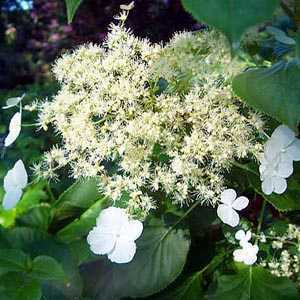 This woody-stemmed climbing hydrangea flourishes in the moist shady conditions where few ornamental climbers thrive. Position: Plant in moist fertile soil and do not allow the soil to dry out while the plant is getting established. This hydrangea flowers on the previous season’s wood so if you need to prune it back do so in late autumn or early spring but be warned that this will restrict flowering the following year.